I was very sad to hear from Steve on yesterday’s gr 2 ride, confirmed later by Rico, of the passing of our fellow cyclist, ‘Little’ Ron. ‘Little’ is a misnomer, as Ron Richardson was a giant of our club and it was good to see that his contribution was celebrated with a special birthday cake presented to him by our leader John M at the annual dinner in 2015. 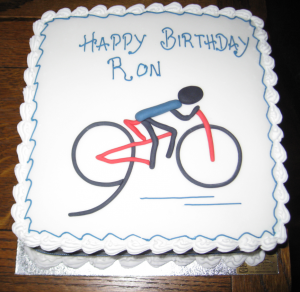 The cake, with a cycling motif, was to celebrate Ron’s 90th birthday. 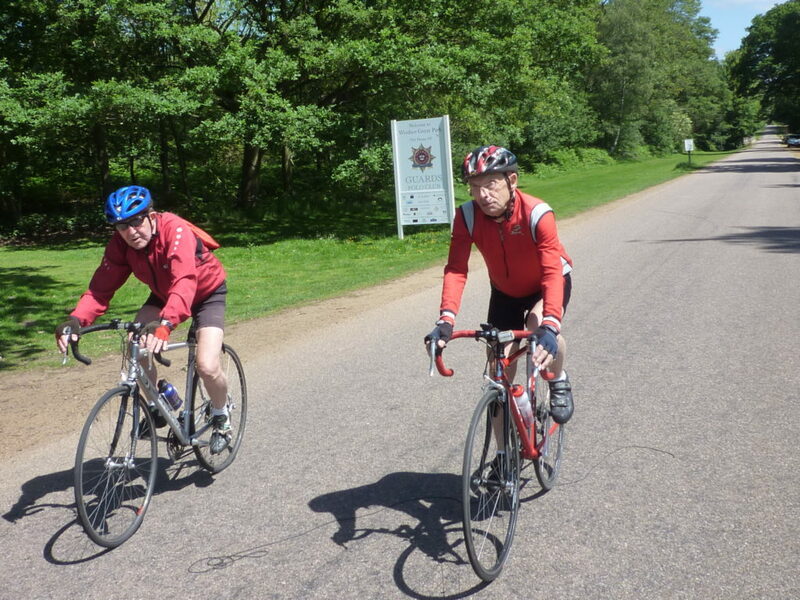 On my first ride with the club a good few years’ back I remember asking Ron when he began serious club cycling. ‘1942’, he replied! 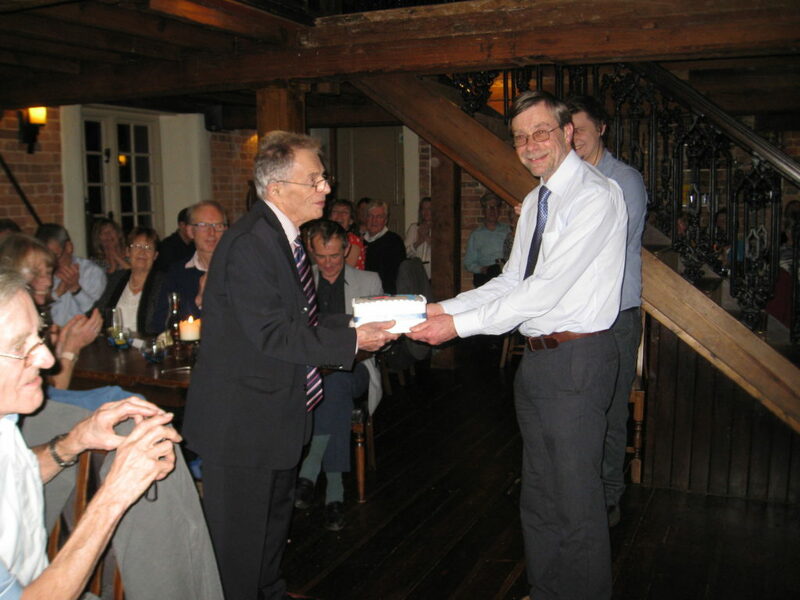 It was when he was in the British army during World War 2. This was before most of us in the club (with honorable exceptions) were born, yet he was still outstripping many of us up hills well into his 80’s. I seem to recall that for his 85th birthday, he did an 85-mile ride. I remember climbing up the hill with him in Windsor Great Park leading to the polo ground and coffee at Savill Garden from the Blacknest gate and him telling me that he was present – as an observer – at the same spot during the final climb in the London Olympics Road Race, 1948. It was an inspiration to have him ride with us. 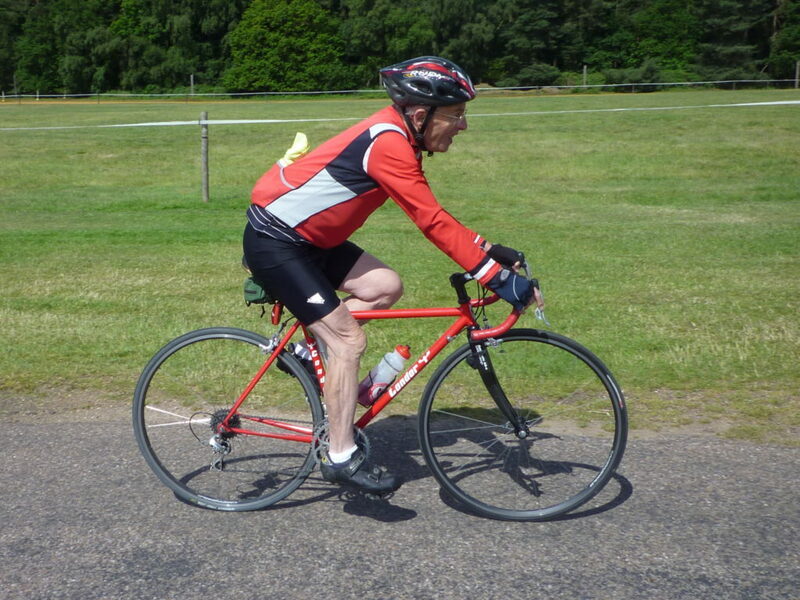 Many of us will have strong memories of him in his red and white stripey Hounslow& District Wheelers shirt, a reminder of his racing and time-trialling credentials, which would match even the hardest of our hard riders. I visited him at his home in West End earlier this year to discuss the future of our paper magazine, ‘West Surrey Cyclist’, which he very much hoped would be revived. He introduced me to the editor of the thriving ‘Quarter Wheeler’, Hounslow & District’s magazine in the hope that we could emulate it, but sadly that wasn’t to be. He was still cycling to the shops and on short rides even then. Ron will be remembered as an absolute gentleman, a humble and honorable man. I’m sure that most of us who rode with him will always have at the back of our minds this thought: ” I hope I’m still riding a bike when I’m Little Ron’s age”! He was an inspiration to all of us who knew him. 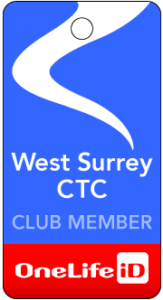 My own personal recollection of Ron is that only about 5 years ago, when he was at least 85, he attended the West Surrey AGM, and then excused himself after some somewhat turgid discussions, explaining that he had to get out on his bike and marshal on an event. For me, that summed up what was truly important. This was so lovely to read thank you.He was true inspiration and a gentle man. 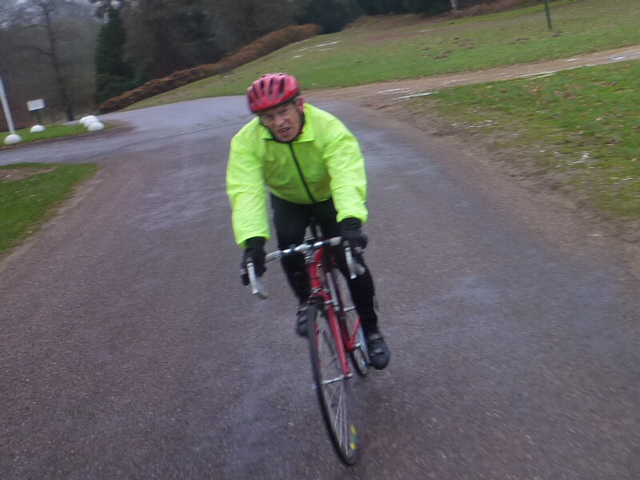 Had many cycling rides in the company of little Ron who invariably was near the front of the West Surrey peleton and a great climber. He also knew all the Surrey roads and if a leader went wrong, he would take the direct route, and get to the pub first. have been informed of this sad loss.